Our fiber studio is brand new and equipped to help YOU make YOUR art! 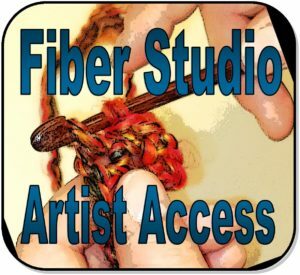 The Fiber Studio is available for Artists to use the space and equipment. To be eligible to use the studios, one must be a current member of the Dairy Barn at the $50 (Individual/Artist) level or higher. Memberships are good for a whole year. (CLICK HERE for a link tot he membership Page) People who have not taken a sewing class at the Dairy Barn must complete an orientation to certify them for studio use. Click HERE to view the Fiber Member Artist Orientation form so you’ll know what to expect. upon becoming a Member Artist, an orientation can be scheduled with Fiber Studio Manager Ann Judy ann@dairybarn.org in advance of studio use by the artist. The function is to make sure member artists know how to use the equipment and understand safety rules and Dairy Barn policies. T he open studios schedule will be posted monthly on the website. Click HERE. In addition to using the studio as a Member Artist during Open Studio Hours, there are more opportunities to utilize the fiber studio. Most Thursday nights, the studio is open to all (including Non-Members) Often there will be activities planned these evenings. Click HERE for more information. 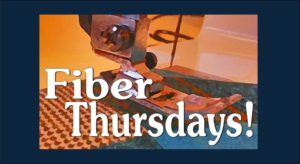 Looking to Sharpen you Skills?Every 2nd Thursday in the Fiber Arts Studio We will have Skill Building-Workshops. Click for a schedule and registration information.